this has become my favorite easy-to-do dessert, I now crave it constantly...a problem. I do not know why I found the receipt but now it's too late, I will either get sick of it or gain weight (although it is calorie friendly). Either way, it is my heaven on earth and you should make it yours as well. 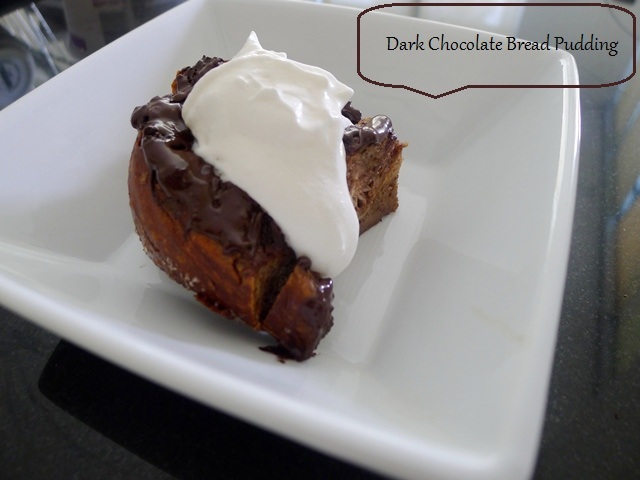 I found the recipe on Skinny Taste a blog that has other amazing treats for you to try. For this round of my bread pudding, i used Valor dark chocolate because this time around there was no Green & Black as suggested in the recipe (i used Green & Black brand in a previous try and it is much better than Valor for the recipe). To follow instructions on how to make it click here. Note: I did not use small ramekins to make individual treats, instead I used a large one and for that reason I had to adjust the recipe. For the ingredients that make up the coating of the bread (that's the ingredients you combine in a bowl) I doubled the amount, so that the bread was perfectly coated.